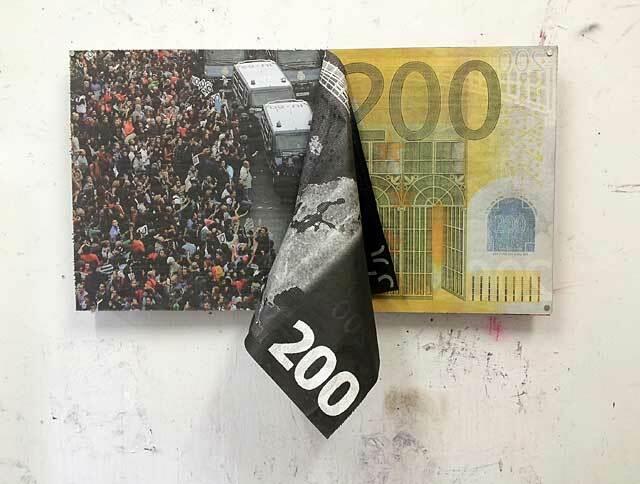 ‘Here Comes Everybody’ is an exhibition of work by kennardphillipps, the collaborative practice of London-based artists Peter Kennard and Cat Phillipps. It will consist of a large accumulation of photographic imagery, comprised of photomontage, digital prints and found newspapers, as well as a major new installation exploring ideas around image consumption, production and camera surveillance. Through the creation of a ‘cauldron’ of material, the artists will highlight what they describe as the ‘cause and effect’ of a range of global issues such as financial austerity, climate change, disease and war. New work for the exhibition has been co-commissioned by Stills and a/political, London.